The rocky and inhospitable shoreline along the outer part of Academy Bay. The slightly more hospitable shoreline of Academy Bay further into the bay. 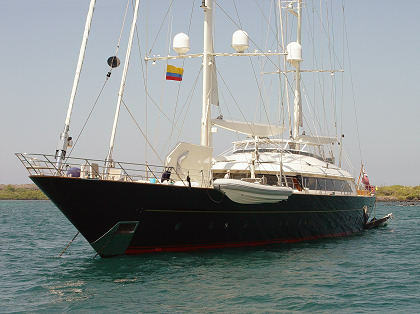 We passed this megayacht while maneuvering through the anchorage. 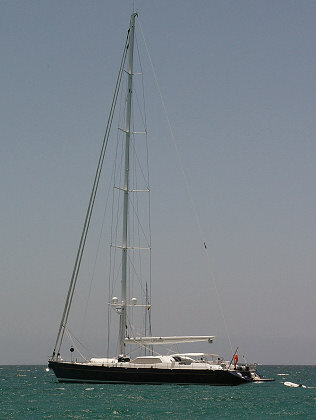 Here's another megayacht we passed. All it takes is a few million, and this could be yours. With the main lowered and secured, David steered the autopilot back towards the anchorage and we continued our approach. As we got near, I thought the anchorage looked crowded but Marcie and David, based on their experience, thought it wasn't particularly crowded. We were pretty close to the anchorage and would soon need to maneuver, so David changed from autopilot to wheel steering and announced it to the crew. Marcie went to the bow to prepare the anchor. As we were motoring through the outer anchorage, a man in an outboard-powered launch came over to us and told us to follow him to a suitable location. He seemed to be a self-appointed harbormaster though he didn't ask for any money. He motored through the anchorage and showed David where to anchor, but of course his launch maneuvered much more easily than our 45-foot blue-water cruiser. It was now very windy with winds gusting well over 20 knots. Nine of Cups handled reasonably well but it was tricky maneuvering through the anchorage due to numerous obstacles. First, there were floats scattered around the anchorage to serve as mooring buoys for boats. Then there were dozens of boats, either anchored or moored to the buoys. Most of the boats had deployed a stern anchor to hold the bow into the oncoming swell. A stern anchor usually has only a little chain and lots of rope; the rope tends to float which created additional obstructions. As he maneuvered, David had to avoid the boats and their anchor lines, plus the stern lines and the mooring buoys, plus cope with the wind, all while scanning for a suitable place to park the boat and drop the anchor. While maneuvering, David saw and avoided a float made from a yellow plastic jug, but we saw to our consternation that there was a length of green line attached to the float that trailed away into the distance just under the surface of the water. Just as Nine of Cups' stern crossed the green line, we saw the jug make a quick dash and we knew we had snagged the line and fouled the prop. Luckily, the engine showed no sign of stopping (which would happen with a heavy line, this was a light line) and we continued motoring towards our anchoring spot. Looking astern, we could see that our boat was now towing the long length of green line with the yellow float. As we turned and passed behind a sailboat, we saw a heavy line trailing from the boat's stern, just under the surface. At just the right moment, David shifted to neutral and Nine of Cups glided over the heavy line without further fouling the prop. Finally, David straightened the helm and motored forward, then called to Marcie to drop the anchor. Marcie tipped up the shank of the anchor which promptly slid off the bow roller and into the sea, trailing the rattling chain. Marcie let out about 150-feet of chain, using the color-coded paint marks she had added at the marina. Nine of Cups drifted back in the strong winds and stretched out the anchor rode. Meanwhile, I watched reference marks ashore to see if the anchor was dragging, but thanks to the 110-lb anchor's massive claw, Nine of Cups settled back on the chain and held fast. It was a tense moment, maneuvering through the anchorage in strong winds with a fouled prop, dodging obstacles as we positioned the boat. 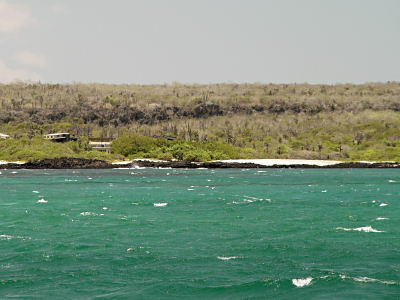 But we made it, and we were officially anchored in Academy Bay, Isla Santa Cruz, in the Galápagos Archipelago. Good job, David! The scenery was quite interesting. The water was pale green, changing to blue in the deeper parts, and covered with rolling chop and frequent whitecaps due to the strong wind. The wind was making both wind generators spin with abandon and they looked and sounded like airplane engines revving up. We were approximately in the middle of the bay, close to the front of the anchorage (that is, the seaward portion). I counted a half-dozen big boats in front of us, and maybe 25 to 30 other boats anchored closer to shore. About a third of the boats were sailboats, mostly private yachts. The power boats were mostly large trawler-style cruising boats; many of those were likely tour boats for paying passengers. The shoreline on the north side of the bay was a low slightly undulating surface that ascended gradually towards a mountain in the distance. Since the mountain was actually a volcano, the slopes that reached the sea were obviously lava flows, now decomposed into enough soil to support quite a bit of arid but green vegetation. 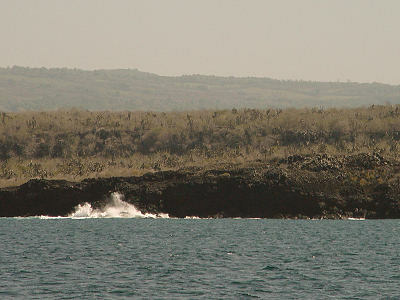 In places, the lava flows ended in abrupt basaltic cliffs, including the oceanfront outside of the bay where the surf crashed into steep black cliffs. Closer to the head of the bay (the landward portion), the shoreline was dotted with small buildings and houses. At the head of the bay was the town of Puerto Ayora, with numerous waterfront buildings and an official-looking building with an Ecuadorian flag whipping in the strong wind. Overall, it was quite an exotic scene, a genuine South Pacific island landfall, albeit not Polynesia. Volcanoes, cliffs, crashing surf, multi-hued water, a community of voyagers at anchor, and a smattering of civilization ashore in a colorful and remote outpost of a town. On the vast majority of the land around the bay, though, all you could see was the green of trees and other vegetation. There was no telling what was beneath the canopy, if anything. After reading about extensive development in the Galápagos, it was refreshing to see lots of green and know that the whole island hadn't been developed yet.